I had so many positive feedbacks with my sketches from Thorpe Park and I thought I’d share my tips, and techniques for sketching outdoors. I was so lucky that the weather was gorgeous for a road trip and day out at the Theme Park. Yes, I did go on few rides and I instantly regretted it! I haven’t been on rides for nearly 7 years! To be honest, I do not miss it! DIY watercolour I used a sweet tin which I love how pretty it looks. Empty watercolour pans and tubes of watercolours and gouache. Gouache has a lovely matte finish when dry and opaque. I prefer the tubes compared to the pans because I can pick and mix the colours I need. Also , I think it’s the acrylic painter in me. Totally go with what you are comfortable with and what works for you. Try out different methods to the one that’s fits with you. 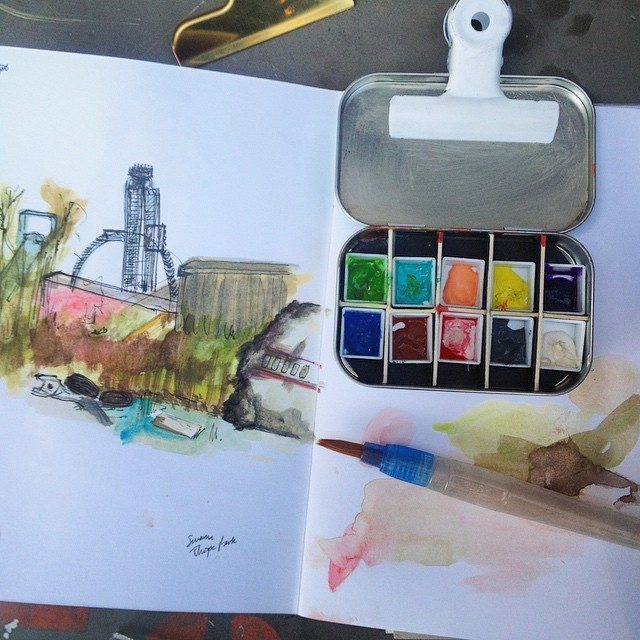 Preset mini watercolour sets with waterpot and mini brush. “The Urban Sketching Handbook, Architecture and Cityscapes,” by Gabriel Campanario I bought this book at a gift shop and I realised I needed to draw more cityscapes and architecture. Tip that worked for me was outlining your horizons. Don’t worry if you didn’t bring the right colours along with you, mix your primary colours and get closer to the colour you want. Go with your instinct! Visualise how you want your sketch to look on the page. Get yourself a comfortable seat! Quick Question: What’s your experiences sketching outdoor? Have you tried it yet? I love sharing my tips and thoughts. 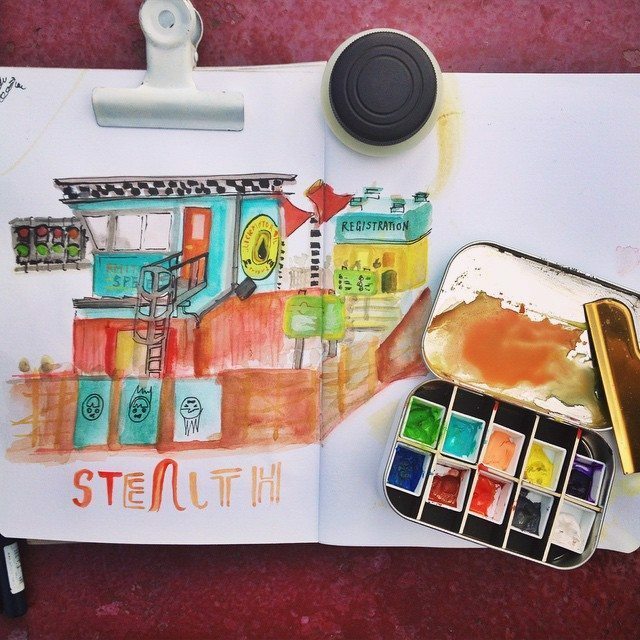 Share with me your photos of your urban and outdoor sketches! Tag me @Junesees on Twitter and Instagram.